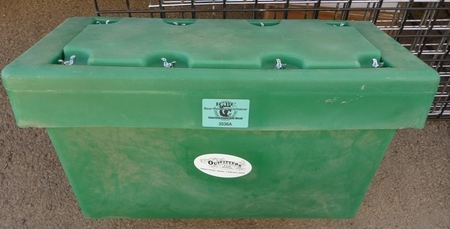 Our Bear Resistant Panniers can be used in any bear restricted area in the U.S. Tough, hard resin polyethylene boxes are U.S. Forest Service approved. Large opening for storage. Lid has 8 x 5/16 threaded wing bolts to hold the top down. We are aware that the opening & closure of the lid is time consuming. But it has to be as difficult as possible for the bear to open/destroy the panniers. The Panniers won't break in extreme cold. These tough, durable panniers accommodate screw-in legs for use as a table (legs sold separately). Sold in a set of two. Take a look at our video, just click on the link below.